This lectern offered a Kansas candidate state-of-the-art security during the 1936 presidential campaign. 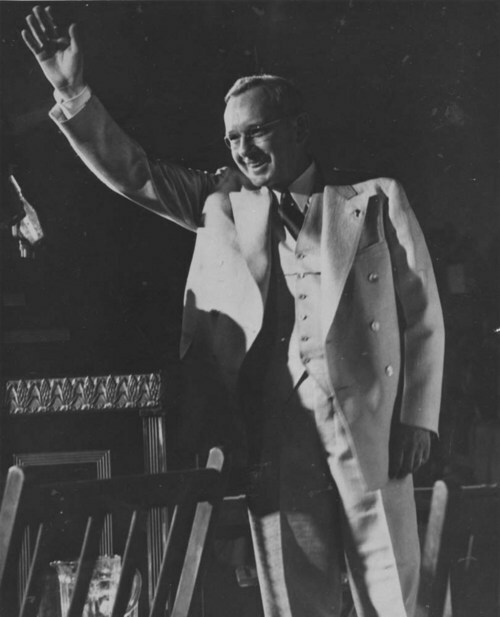 Kansas Governor Alfred "Alf" M. Landon used the lectern while stumping the country in his bid to defeat the popular incumbent, Franklin Roosevelt. Landon served as Kansas Governor at the time. First elected to that office in 1932, he was the only Republican governor in the country to gain reelection in 1934. This made him attractive to the Republican Party, desperately seeking a candidate with the chops to defeat Roosevelt. Unfortunately for the Republicans, Landon did not relish campaigning and often avoided the practice altogether. By contrast, Roosevelt utilized the national media in expert fashion. "My entire security consisted of a bulletproof-steel speaker's podium that reached up to my chin—all you could see was my head—and one bodyguard, a retired federal agent hired by the campaign committee. That podium went everywhere with me on the train. It took four big men to load and unload it." The lectern actually is made of lead, rather than steel. The lead panels are japanned black, setting off brass highlights featuring the enduring Kansas symbols of wheat and sunflowers. As followers of political history know, Roosevelt defeated Landon by a landslide. The Kansan carried only two states, Maine and Vermont. He returned to his home state and never sought political office again. Landon was greatly pleased, though, when Kansans elected his daughter to the U.S. Senate. Nancy Landon Kassebaum (later, Baker) was the first female Kansan elected to that body, and the first woman not elected to the office formerly held by her husband. Baker later donated many items related to her father's political career to the Kansas Museum of History. Besides the lectern, these include political cartoons, sheet music for songs written especially for the candidate, campaign novelties, and the "Kansas" delegation sign from the 1936 Republican National Convention in Cleveland.